The Iraqi Defense Ministry said that Russia supplied Iraq with a new batch of Mi-28NE “Night Hunter” military helicopters. BAGHDAD Russia supplied Iraq with a new batch of Mi-28NE “Night Hunter” military helicopters, the Iraqi Defense Ministry said on Tuesday. “These helicopters will make a great contribution in support of ground forces in their operations aimed at targeting terrorist positions and destroying [their] armoured vehicle packed with explosives,” the ministry said in a statement published on its website. On June 3, spokesman for the Iraqi Joint Special Operations Command Yahya Rasul Zubaidi said that Russian-made helicopters including the “Night Hunter” (NATO reporting name Havoc), used by the Iraqi army had demonstrated their effectiveness during the offensive in the city of Fallujah against Islamic State, a terrorist organization banned in Russia, the United States and many other countries. The ministry also said that the “Night Hunter” helicopters had increased maneuverability and targeting precision of the Iraqi army. Mi-28NE is a highly effective new-generation helicopter, designed for combat missions in any circumstances. The helicopter is designed to take part in operations against tanks, infantry combat vehicles and armoured personnel carriers among other targets. ROSTOV-ON-DON, March 16. /TASS/. The production of the Mi-28UB dual-control attack helicopters for the Russian army may begin in the near future, Deputy Managing Director of Rostvertol (a subsidiary of the Russian Helicopters holding) Vadim Barannikov said on Wednesday. “As for the Mi-28UB helicopter – a version of the Night Hunter with dual controls for the Russian army – we have been working for quite a long time on it with the Defense Ministry’s specifications, and I think that the company will start the helicopter’ manufacturing soon. We are ready to begin the production of such helicopters when the Defense Ministry makes an order to this effect,” Barannikov said. According to him, the Mi-28UB helicopter will be largely similar in characteristics to the Mi-28NE export version with the dual control system that makes it possible to control the helicopter both from the pilot’s cockpit and from the cockpit of the operator pilot who acts as an instructor. Barannikov said that the company is currently in negotiations with “two or three foreign customers” on possible supplies of the Mi-28NE helicopters. “And at the MAKS-2015 exhibition about five or six countries took a serious interest in them”, the Rostvertol deputy director said. According to him, the countries that have experience in using real combat helicopters and operating Russia’s Mi-8 and Mi-24 type helicopters are the customers for Mi-28NE. Barannikov also said that the Mi-28 helicopters are equipped with the VK-2500 engines manufactured by a Russian company, so there is no problem with the engines. “Keeping all the functions of an attack helicopter, the dual-control Mi-28NE greatly simplifies the training process of military pilots who need flying hours on the Night Hunter. The new helicopter has a larger cockpit, equipped with modern energy-attenuating seats”, the holding said earlier on Wednesday. According to Rostvertol, the first prototype of the Mi-28NE helicopter with dual flight controls was made in 2014, and in late 2015 the joint state tests were completed. Two contracts on the helicopters’ supply to foreign customers have been signed by now. “The unique capabilities of the new combat helicopter open excellent prospects for its sale both in Russia and abroad”, Russian Helicopters CEO Alexander Mikheyev was quoted by the company’s press service. The dual-control Mi-28NE is a new-generation all-weather attack helicopter. Its main objectives are to destroy armored vehicles, hit low-flying low-speed air targets, aerial reconnaissance, as well as target detection for combat helicopters and warplanes. 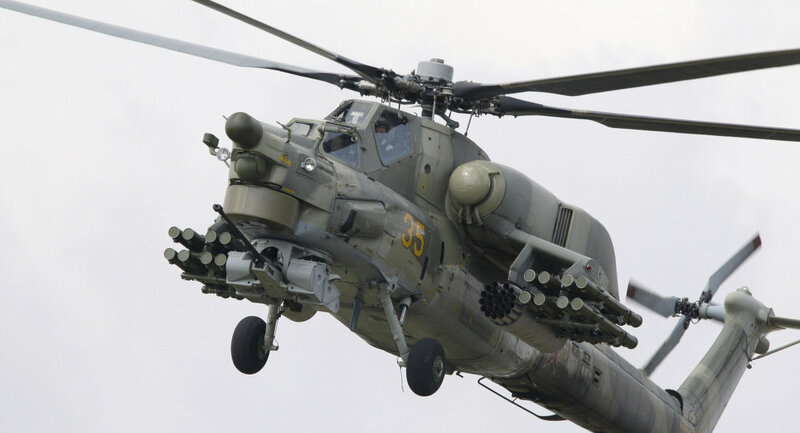 The Mi-28N gunship is armed with a 30mm cannon, guided missiles and free rockets. The Night Hunter can locate and destroy armored vehicles, personnel, small surface ships, and low-speed air targets and fortifications, as well as lay mine fields day or night in adverse weather conditions. The aircraft’s cockpit is reliably armored against armor-piercing bullets and projectiles of 20 mm caliber. 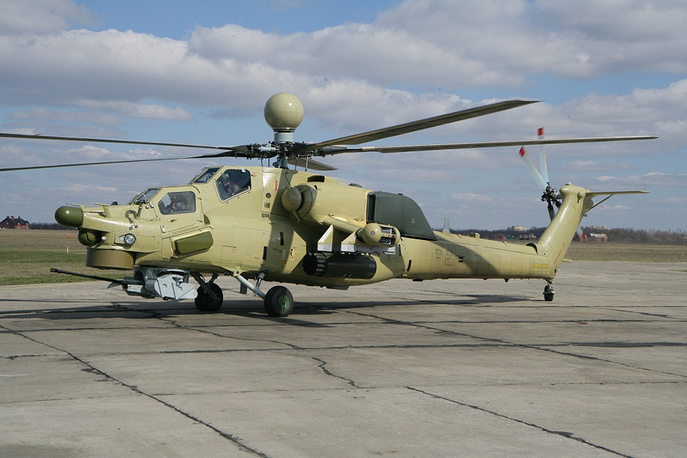 Russia is developing a multifunction image processing system and an upgraded laser guidance system for guided weapons for its newest Mi-28NM attack helicopter. Russia is creating a modernized weapons guidance system for its newest Mi-28NM (NATO reporting name “Havoc”) attack helicopter, the head of Russia’s Ryazan State Instrument-Making Enterprise said Thursday. “As part of the development work, a multifunction image processing system and an upgraded laser guidance system for guided weapons is being developed. Both products are different from previously available analogues, with a whole range of upgraded technical characteristics in accordance with the required technical specifications and the best possible solution for issues of import substitution,” Pavel Budagov told RIA Novosti. The Mi-28NM is a modernized version of the Mi-28N Night Hunter attack helicopter that is being upgraded to a fifth-generation aircraft, which has been in development since 2008.Since the start of the development, Russia had received more than 10 export orders for helicopters of this type.